This unit of work was created in partnership with The Garret and accompanies their interview with Hannie Rayson. Please click here to access the Interview, Bibliography, Show notes and Transcript, and Author profile. The following activities have been designed to be adapted and selected for teacher and teaching context. The activities have been formulated for use with a whole class or small groups. All activities can be adapted to suit smaller groups or individual students. Each activity is linked to a specific section of Hannie Rayson’s interview and the relevant portion of the interview is noted at the beginning of the activity. This activity relates to 1.00 mins–4.37 mins of the interview. 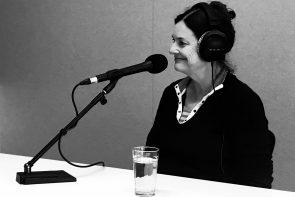 Hannie Rayson does not think that her plays are autobiographical although she does admit that perhaps some subconscious autobiographical element does occasionally creep into her work. However, her memoir Hello, Beautiful! is obviously and explicitly a series of recollections about her own life. It is subtitled Scenes from a Life. Interestingly, and probably inevitably, given the nature of at least some of Rayson’s plays, the personal is intertwined with the public. For example, in the chapter ‘Two Weddings and a Funeral’ Rayson writes about her brother’s marriage to a woman of the Roman Catholic faith and this leads to a reflection on the sectarian rifts in Australian society in the past, and to attempts in the mid-twentieth century by political operatives affiliated with the Roman Catholic Church to influence the direction of Australian society, culture and politics. Explain to students that a memoir is a written recollection of a significant event from the past. The event will have had an obvious emotional effect on the writer and will be something from which s/he will have taken a message about life. Perhaps read short extracts from such memoirs as My Place by Sally Morgan, Am I Black Enough For You? by Anita Heiss, Unpolished Gem by Alice Pung or even from Hannie Rayson’s own memoir Hello, Beautiful!. This activity relates to 3.40 mins–6.08 mins and 25.03 mins–25.32 mins of the interview. It is probably true to say that, even today, attempts to define a national identity for Australia fall back on the twin myths of the Bush and the Anzacs. (Here, the word ‘myth’ means a story that we tell ourselves about our past, present and future.) Examples for these two ‘myths’ could be advertisements for R. M. Williams’ clothing, and the vast sums of public money spent on militarising the nation’s history. However, these myths have concealed the reality that Australia is one of the most urbanised countries in the world. This reality was not reflected in the art and literature of the country until the 1970s when writers like dramatist David Williamson and novelist Helen Garner convinced Hannie Rayson that her own culture was worth writing about, that a ‘backyard in Melbourne’ could be the setting for a play or novel. Earlier, Donald Horne’s critique of Australia, The Lucky Country, had been published in 1964. This was not a celebration, but a harsh criticism of the country, especially its leaders. Nevertheless, these writers convinced Hannie Rayson that she could explore in her own plays what it meant to be Australian. Provide students with short synopses of, say, David Williamson’s play The Removalists (described as a microcosm of Australian life dealing with violence and the abuse of power and authority) or Helen Garner’s Monkey Grip (about bohemian life in inner-city Melbourne) to give them an insight into the emerging concerns of a ‘new’ Australia. Students may also be interested in hearing about plays like The Summer of the Seventeenth Doll by Ray Lawler (which deals with universal themes of love, age and disillusionment, but has a quintessentially Australian background of cane cutters in far North Queensland although the play itself is set in Melbourne) and The One Day of the Year by Alan Seymour, an iconoclastic challenge to the Australian reverence for Anzac Day. Show students short excerpts of such ABC programs as Australian Story and Back Roads (both available on ABC iview) to illustrate the possible raw material for an Australian playwright. Ask them to write a synopsis of the incident (about 250–400 words) as a prelude to perhaps actually writing their own play. The synopsis should give details of the incident but also include their feelings about what happened, the life lessons they learnt from it and so on. They should also reflect on the ‘Australianness’ of the incident. This activity relates to 8.10 mins–10.52 mins, 16.37 mins–17.35 mins and 21.32 mins–22.52 mins of the interview. One important reason for this is that writing for the theatre is a very collaborative enterprise, involving the writer/s, actors, director and others in the creative process. She explains that she does a lot of re-writing during rehearsals and that she has also had the chance to re-work plays before they are performed again in another venue. In order for students to experience the collaborative nature of producing a play, ask them to undertake this exercise based on a role-play idea used by English and Drama teachers at the University of Sydney (and outlined in Chapter 21, ‘Playscripts and Performance: Page and Stage’ by John Hughes in Charged With Meaning, eds. Gannon, Sawyer and Howie, 2009, Phoenix Education Pty Ltd, Putney, NSW). Ask two students to role-play a tennis match. Invite the class to critique the performance. Divide the class into the groups which collaborate in the production of a theatre production: directors, set designers, make-up artists, lighting technicians, actors, and sound and costume designers. Ask these groups to research the function of their group and then come up with suggestions for improving the original role-play. Re-stage the tennis match role-play with the original participants, using the suggestions that have been made to them by the expert groups. Build on this first role-play exercise by having students transform a ballad or folk tale into a short play complete with spoken script. The original text (e.g. a ballad like Sir Patrick Spens) will provide students with the raw material for their own dialogue. This exercise should give an acting role to all students in either the whole class or a large group, but again discussion around what the expert groups listed above might contribute can precede performance. Ask students now to re-visit the memoirs they wrote earlier based on a memoir picture book. Ask them to transform their memoir into a short play script. Then have them annotate the script with the sorts of suggestions that might be made by the expert groups listed above. This activity relates to 17.40 mins–19.52 mins of the interview. Hannie Rayson would undoubtedly reject being labelled as an ‘issues’ playwright but, like Miller, she does locate the characters in her plays within contemporary socio-political contexts. She tells Nic Brasch that she likes to identify a social phenomenon and use writing to explore and understand it. She says that ‘…my plays are a response to particular contemporary social phenomena which I want to understand more fully’. In Hotel Sorrento, for example, she probes the concept of an Australian identity while in her play Inheritance she explores the phenomenon of the One Nation political party led by Pauline Hanson which has exploited the insecurity of many white Australians in the face of multiculturalism and the economic decline in regional and rural Australia. Her characters give voice to a range of attitudes to these social and political changes from Lyle, the embittered and unsuccessful white farmer to Nugget, the adopted Aboriginal son of the Hamilton family who is yet again denied his ‘inheritance’. However, the characters in the play are not mere stereotypes; they display all of the internal contradictions that we would associate with real people. The Crucible and Death of a Salesman are both available on DVD. Show students at least several important scenes from these plays and ask them to consider why Hannie Rayson describes Miller’s style as ‘in your face, over the top’. Discuss with students any contemporary social phenomenon that they think could be explored through dramatic writing. Choose one of the social phenomena identified e.g. the issue of multiculturalism in Australia (here The Garret interviews with Melanie Cheng and Christos Tsiolkas could be helpful), and brainstorm the various positions that Australians are likely to take on this issue. Explain that the different attitudes to the topic are what will generate dramatic tension in a stage play. List five characters who will embody different attitudes to this issue e.g. a white, conservative politician; a recently arrived migrant from a Middle Eastern country who adheres to the Islamic faith; and so on. In groups of five ask students to adopt one of these character roles and prepare a short soliloquy to voice the position of their character. Families feature strongly in at least some of Hannie Rayson’s plays. (She says in the interview that family shapes us.) In Hotel Sorrento, for example, a family re-unites when two of its members return from overseas and unresolved resentments from the past produce the conflict of the play. In Inheritance contemporary social and political issues are played out through the interactions of three generations of the one extended rural family. This culminating rich assessment task focuses on families and their interactions and contexts. Download the Assessment Task (PDF, 91 KB). John Thomas has been an English teacher and Head of Department (English) in various Queensland high schools over a period of almost 40 years. His last full-time teaching stint was at an independent boys’ school in Brisbane where he worked for six years. He also served for a number of years as the chair of the Cairns District Review panel (English) for the Board of Senior Secondary School Studies. John feels fortunate that his teaching life coincided with major developments in our knowledge about language, literacy and literature, and in particular became interested in Continental literary theory and Hallidayan grammar and how these can be applied in the classroom. John has now entered semi-retirement.